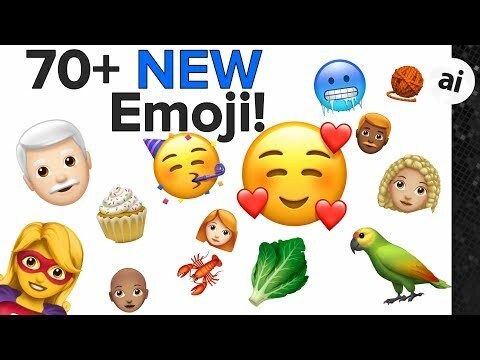 More than 70 new emoji will be coming soon to iOS 12 and macOS Mojave, including new characters with red hair, gray hair and curly hair, a new emoji for bald people, more emotive smiley faces and additional emoji representing animals, sports and food. Beyond the new physical traits, sports fans get new softball, frisbee and lacrosse, emoji with outdoor adventurers getting luggage, compass and a hiking boot to accompany the existing climbing emoji. The new emoji are included in Tuesday's developer and public beta releases of iOS 12.1. Apple says that they will be available in upcoming software updates for iOS, macOS and watchOS. Apple had previously mentioned the additions . Apple's new emoji characters are created based on the approved characters in Unicode 11.0, with the company saying that they are working with the group to add more disability-themed emoji to the keyboard for Unicode 12.0, slated for release in 2019. We've come full circle. I remember when all face emojis were bald. One can never have too many emoji. When Apple put the Emoji key where the Numerical key is supposed to go it was Bye Bye Emoji. $20 says the pleading emoji is going to be more popular than the rest combined. Also, incredibly dumb that Apple doesn't allow us to create a set of pre-made mimojis that we can use on the fly (you know, like how all other emojis work). It's the one thing that would turn mimoji into something beyond a gimmick, and it would be so easy, and of course Apple doesn't even bother to make it. The story of nearly every services failure. Lack of basic understanding of how people use social features. You should be able to create your Memoji character and then Apple uses it to fill out the entire gamut of available expressions (which then could be further edited). I agree they tend to exhibit tunnel vision when it comes to their users in many respects. Yes, good point. And also incorporate other things that make it more fun and playful, like bitmoji does. I was playing around with mimoji just now, and I don't know wth Apple is doing. You can't wink, you can't make a kissing expression (or duck face, if you're into that sort of thing..), and the facial expressions in general seem kind of limited in their expressiveness. For an animated version of yourself, it's not very...animated. Emoji’s are cool fluff, but I’d rather see Apple direct some of those valuable developer resources to fixing bugs in iOS 12 and Mojave. Maybe after the bug backlog drops down to manageable levels they can free up some folks to work on emojis.